Australia has a tendency to claim things and people that are actually originally from our closest neighbours, New Zealand. For example, Russell Crowe and Keith Urban, who most people think are Australian are in fact both born in New Zealand. So when Michael Dobson sent us this radical R80RT build, part of the conditions were that we made sure our readers knew the bike was built in Australia New Zealand. Of course we reluctantly agreed. Michael has one impressive resume, which includes being a motorcycle mechanic for 34 years, specialising in servicing and primarily building BMW police bikes for over 20 of those years. That in itself is impressive, but the list also includes a stint as a successful race mechanic in BEARS and production racing, a workshop foreman at Motorad and a “semi famous Ural pilot”. So if there was one guy who we would choose to build us a custom Beemer, Michael is the perfect candidate. 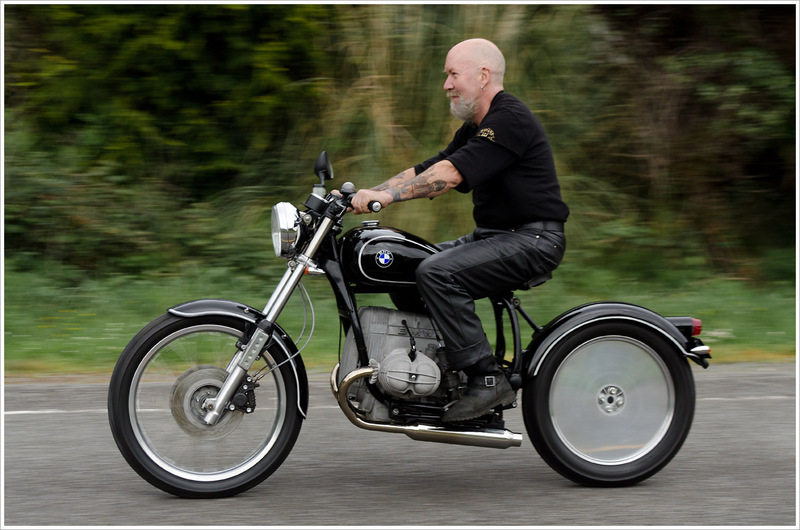 Michael started the project with a 1986 NZ Police R80T which he helped assemble many years back. “It was one of 120 that a younger me helped assemble and deliver” he says. “After a disposal auction, passing through the hands of several friends and many miles, it became “my next project”. It is now an example of what happens “when good cops go bad”. “Originally I intended to loosely follow the bobber style but having read far too many chopper magazines in the early 70’s, I found it evolving into a mix of bobber and chopper which I have called “Bopper Style”.” Michaels personal requirements for the bike were that it needed to have good brakes, lights, tires and mudguards with a comfortable riding position. “This I have achieved” he says. Mike has used many different BMW parts on this bike. The front wheel is a 21” BMW R80GS, and the rear wheel is actually a standard R80 mag with polished sheet aluminum discs glued on. The forks are from a R100CS with 2” over stanchions. Head light is from a R1200C and the handlebars (in garage shots) are from a K100RS which have been reversed and dropped forward. 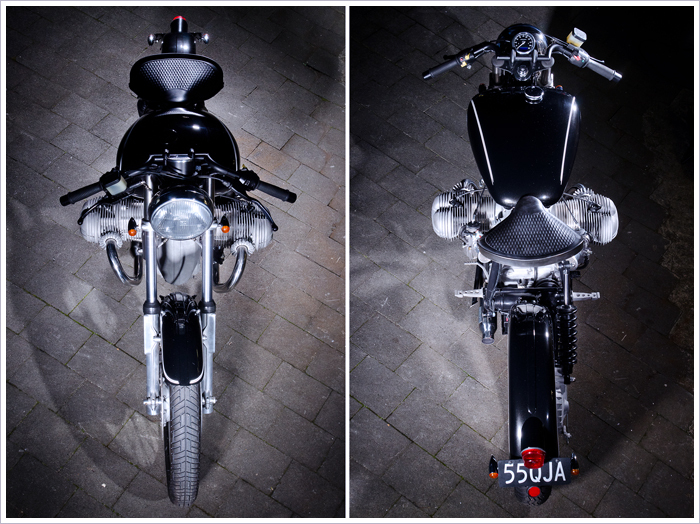 The frame is a standard R80 with sub frame and pillion peg hangers removed. 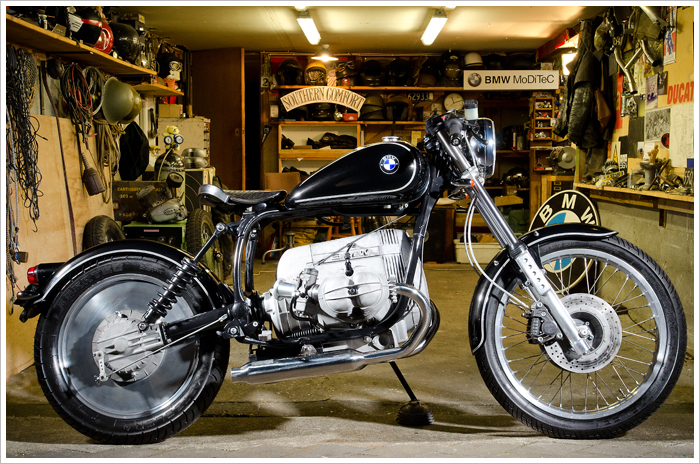 The bike also pays homage to the older BMW’s, with HT leads coming out of the top of the engine, single (Ural) seat, old logo and classic black and white paint. The engine has been fully rebuilt and fitted with Siebenrock 1000cc kit. Also adding Dellorto PHF 36mm Carbs. Speedo is a Motogadget chrono classic. The petrol tank is surprisingly from a Keeway Cruiser much modified by Kiwi Race Cars who also ribbed the british rear mudguard. 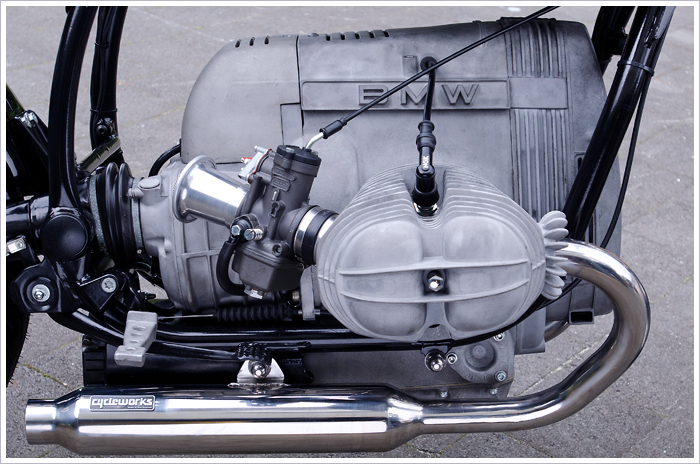 The exhaust is a one piece stainless by Cycleworks who also made the battery box and rear guard support. 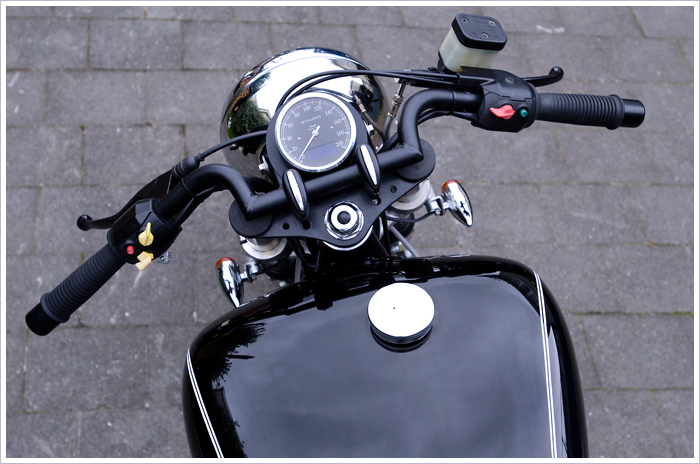 Airbox has been replaced by a custom cast alloy cover made by Ken Howe conceals electrics. The tail light is a slash cut exhaust pipe with Hella trailer light attached. Lastly the metallic black paint job was by Todd Moffat and the beautiful hand pin striping and air brushed pre-war BMW logos were done by Kurt from Juniors Kustom Rides. 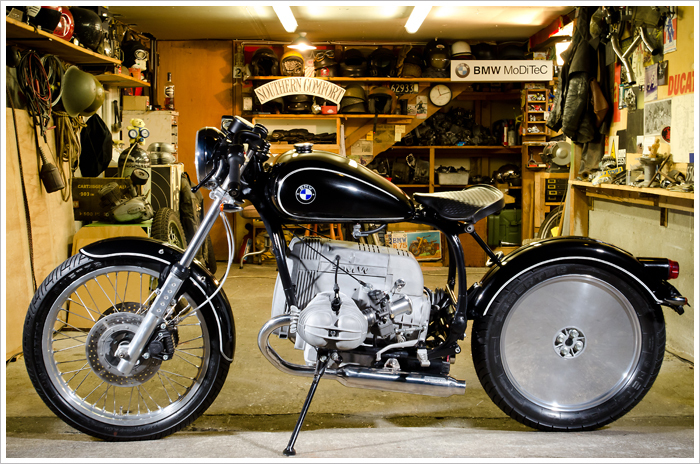 Michael has done a sterling job turning this 1986 BMW into a timeless bobber cross chopper. It may have taken him two years to build this amazing bike part time, but usually it takes time to do it right. He tells us he has worked at a much faster pace building Beemers in the past. 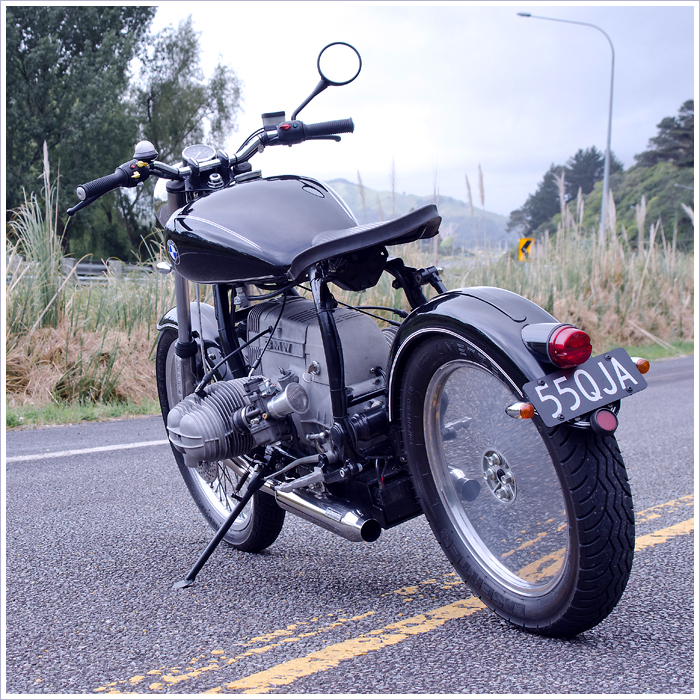 “In 1985 we once uncrated and assembled 90 BMW R80RT bikes in a week for the local NZ police” – now that is one productive week.